Sold by us at Goffs last year, this 4 year old trained by Conor O'Dwyer and ridden by B Dalton won the maiden hurdle at Limerick by 2 1/2 lengths. He has been placed in all his starts to date. Winning the maiden hurdle at Doncaster by 4 1/2 lengths, this 4 year old gelding has now won 2 of his 3 starts to date. Trained by Nicky Henderson he was ridden by Andrew Tinkler. Billyvoddan won the Aga Ladies Open impressively at The Harkaway Point to Point at Chaddesley Corbett, with Jane Williams in the plate. He came back bouncing and is a credit to Phil Rowley and the team down at Poplar Cottage. The aim will be to try and run in the AGA final at Cheltenham again this season. 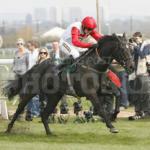 Sprinter Sacre has won the William Hill Novices chase at Kempton today, beating Peddlers Cross by 16 lengths! This 5 year old, broken here at Mill House Stud, won the Jenny Mould Memorial Handicap Chase at Cheltenham. He is trained by Nigel Twiston-Davies and ridden by son Sam. This 5 year old, broken and ridden away at Mill House, won the Novices Chase at Doncaster on Friday. Leading from the 6th he made it look easy. 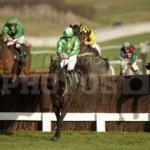 He is trained by Nicky Henderson and was ridden by David Bass. This 5 year old, sold by us back in 2009, made all to win the Novices Hurdle at Newcastle on Saturday. Trained by Sue Smith he was once again ridden by Henry Oliver. This 9 year old homebred gelding, trained by Sue Smith, won the handicap chase at Newcastle on Saturday, ridden by Henry Oliver. His dam in now in retirement with us and we hope that her other progeny can repeat his success. This 5 year old, bred here at Mill House and sold by us as a foal, won on his hurdling debut at Taunton last Thursday. 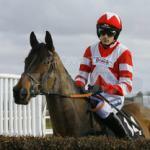 He is trained by Paul Nicholls and was ridden by Ryan Mahon. This homebred 9 year old has come back to his winning form again, under the watchful eye of David Pipe in the handicap chase at Ascot, winning by 3 3/4 lengths from his nearest rival. He was ridden by Hadden Frost. This 4 year old has just won the bumper at Ludlow, making all to win on his first ever run. He came to us as a yearling and was subsequently broken in and ridden away as a 2 and 3 year old before moving on to Nicky Henderson's at the end of this summer. He was ridden by AP Mcoy and we look forward to seeing more from him as the season progresses. This 4 year old came to us as a foal from France and was subsequently broken in. After a quiet run in a point to point at the end of last season, he was sent into training with Nigel Twiston-Davies and won on his first outing in the Maiden Hurdle at Stratford yesterday. He beat his closest rival by 3 1/2 lengths and was ridden by Sam Twiston-Davies. Following up his impressive win last month, Magnifique Etoile won at Stratford on Saturday in the maiden hurdle, beating his nearest rival by 13 lengths. He was once again ridden by Felix de Giles and is trained by Charlie Longsdon. This 5 year old, trained by Charlie Longsdon won again at Worcester yesterday in the 2 mile 7 furlong Fred Rimell Novices Chase. He made all to win by 2 lengths and was once again ridden by Felix de Giles. This 5 year old gelding was also consigned by us back in 2009 as a 3 year old at Doncaster Spring Store Sale. 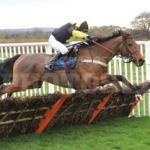 He was bought by Harvey Smith and subsequently trained by Sue Smith, who won with him up at Hexham in the 2 mile 4 furlong maiden hurdle on Saturday. He won this easily by 21 lengths and was ridden by Henry Oliver. This 5 year old was broken by us back in 2009 and went to Charlie Longsdon's where he has won over hurdles twice and been placed. This was only his second outing over fences with Felix De Giles on board who steered him to victory at Worcester on Friday. This homebred 3 year old, now trained in Germany by Christian Sprenger, won at Dortmund yesterday, 1st of 14 runners. He was sold by us as a foal back in 2008 and is the half brother to Divine Power and Mystery Ocean, both of whom are now broodmares with us at home and Penkenna Princess. Billyvoddan and Barbers Shop went for their first day's qualifying with The Wheatland Hunt today. Ridden by leading West Midland area lady jockey Jane Williams and Fleur Tyler-Morris our secretary they had a lovely morning and settled into it well. Penkenna Princess was bred by us back in 2002 by Pivotal out of Tiriana. She is now a broodmare out in Japan and her yearling filly by Deep Impact sold over there for $414,635 making her one of the top 4 lots of the sale. Penkenna Princess is the 1/2 sister to Divine Power, Mystery Ocean and Naaseh. This 3 year old homebred won impressively in Deauville. Sold by us as a foal in 2008 for 70000gns he is now trained over in France by C Sprengel. Won for the second time in 2 weeks at Uttoxeter in the 2 mile handicap chase. This homebred 8 year old is trained by Bob Buckler. This homebred filly won the EBF 2 year old Maiden Race over 5 furlongs at Beverley on only her second outing. She was ridden by Liam Jones and kept on strongly in the final furlong beating Red Shadow by 2 3/4 lengths. She is trained by William Haggis. This 4 year old was consigned by us at last year's Doncaster Spring Store Sale and made £30000. He has gone on to win on only his second outing in the Bumper at Newton Abbot. 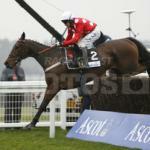 Leading from 2 furlongs out he won comfortably, and is trained by Paul Nicholls. This 2 year old filly was sold by us last year at Doncaster for £26000 and subsequestly went on to win first time out in the Maiden fillies Stakes at Thirsk by 2 1/2 lengths from a field of 16. She is trained by Richard Fahey. This 5 year old gelding was sold by us as a yearling and has subsequently gone on to win on only his second run over 2 miles in a bumper at Perth. He is trained by R Bewley. This 12 year old ex chaser has had a brilliant second season between the flags, being ridden in Ladies Open's by Jane Williams. 3 wins from 3 runs secured him a place in the AGA Ladies Open Hunter Chase Final at Cheltenham, where he won going away from the others after a very patient ride. He will now be turned away for the summer before coming back in for next season. This homebred 4 year old won his 1st bumper impressively at Fontwell by 11 lengths. He is trained by Colin Tizzard and would be one to watch next season. Sold in 2003 and subsequently broken by us, this game horse is now making a name for himself Hunter Chasing, under the watchful eye of Nigel Twiston-Davies. Having unseated when in front in the Cheltenham Foxhunter's Chase, he made virtually all in the Aintree Foxhunters winning impressively with Willie Twiston-Davies on board. This bold 6 year old filly who was broken by us back in 2008, achieved black type at Newbury by winning the EBF Mares NH Novices Hurdle beating What An Oscar by 4 lengths. she won well in strong company including Semi Colon who is another of our breakers. Trained by Alan King, this 5 year old was sold by us at Doncaster Spring Store Sale in 2009 for £25000. He won the 2 mile 5 furlong Maiden Hurdle race at Warwick with ease and was ridden by Robert Thornton. This 5 year old came 3rd in the Stan James Supreme Novices Hurdle at Cheltenham. Trained by Nicky Henderson, he has not been out of the first 2 in any of his 5 starts to date. He came to us as a 2 year old and was broken here before going to Seven Barrows. He will be one to watch next season. This 5 year old filly won the Mares only Novices Hurdle over 2 miles 3 furlongs at Exeter, by 6 lengths. She came to us as a 2 year old and was broken in before going into trainingwith Nicky Henderson. This homebred 9 year old won impressively in the Novices chase at Haydock. Trained by Sue Smith he was 10 lengths in front going over the last and held on strongly. Swing Quartet has now retired from breeding with us at home and we look forward to seeing more from this gelding and her other offspring. Once again this former Mill House inmate, trained by Nicky Henderson, put up a fine performance when winning the Grade 2 Novices Chase at Ascot. He was ridden by Barry Geraghty and seems to appreciate running in smaller fields. 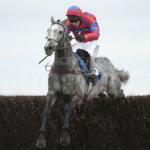 This 4 year old white gelding won first time out in the NH bumper at Warwick over 2 miles. He was consigned by us at Doncaster Spring Store Sale back in May 2010 and is now in training with Richard Lee.